Architecturally, Bedford Park can be seen as the embodiment of the newly-fashionable Queen Anne Revival style of the 1860s. This was a somewhat inaccurate term describing a combination of 17th and 18th century English and Flemish domestic design, which also incorporated eclectic motifs drawn from many sources. The resultant red-brick, tile-hung houses were a startling contrast to the stucco terraces, gothic mansions and drab brick streets being built elsewhere at the time. Unlike many contemporary houses, Bedford Park had no basements and front gardens were marked by wooden fences rather than iron railings. Design features included rubbed-brick arches and dressings over and around openings, terracotta embellishments, open-bed and broken pediments, monumental chimneys, shaped and Dutch gables, tile-hung gabled walls, white painted balustrades, balconies and bay-windows. Bedford Park pioneered a number of concepts later used and formalised by the designers of the garden city movement. Indeed, it is arguable that here is a more successfully semi-rural environment than Bedford Park’s more carefully planned successors. Britain in the first half of the 20th century developed a form of suburbia that is unlike anything else in the world, and this estate represents a turning point in the architecture and layout adopted for it. Without the intellectual framework of garden city pioneer Ebenezer Howard and the socialist influence of William Morris, it is perhaps all the more remarkable that one man should have created such a place, and such an influential social experiment. 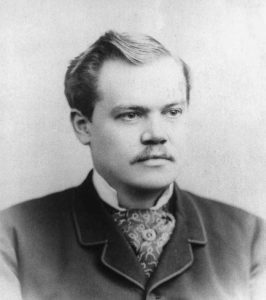 Carr’s vision is not diminished by the fact that he was a slightly dubious property developer, nor the decline of his business through his less shrewd ventures. He was treading new territory, and it is right that he should be remembered for it. Though now swallowed up by Greater London, Bedford Park still retains its identity, community spirit and the unique character bequeathed by Carr’s inspiration and Shaw’s genius. Architect, theatrical designer, antiquary, writer, designer of furniture, textiles, ceramics and wallpaper – Edward Godwin was a man of many talents. By the time Jonathan Carr, Bedford Park’s founder, saw his designs for houses in Nottinghamshire he was already established. Mr Carr was looking for homes that would be cheap to build and could be varied to fit different plots. The first Godwin designs, published in Building News in 1876, were roundly criticised for their steep stairs, small rooms and passageways and having a lavatory in the bathroom. ln the event only a few – somewhat modified detached and semi-detached houses – were built and Jonathan Carr found other architects for his new suburb. You can see Godwin designs at numbers 1 and 2 The Avenue (original working drawing below); adaptations by the estate surveyor, William Wilson, include houses in Queen Anne’s Grove, and Woodstock Road. While incorporating the gables and hanging tiles, which became a Bedford Park signature, the Godwin houses are noticeably taller and thinner than their successors. It is unlikely that the architect was particularly upset by his critics. While his talents were undeniable, his private life, bohemian tastes and friendships, made him anathema to the more straitlaced sections of Victorian society, and he seems in any case to have been an outspoken, individual who preferred being an outsider. Born in Bristol in 1833, the youngest of five children of a leather merchant, Edward Godwin was apprenticed to Iocal architect William Armstrong. Perhaps because of the poor training he himself received, he was always interested in teaching architectural students. He set up practice in Ireland, returning to England in 1859 when he married Sarah Yonge. Their home in Bristol was decorated with Persian rugs on bare boards, plain coloured walls and Japanese prints, which he considered healthier than the cluttered carpeted look then in vogue. By now he had became friends with painter James McNeill Whistler and William Burges. His first major success was winning the competition for designing the Italian Gothic Northampton Town Hall in 1861. He went on to design castles in Ireland and various buildings for the English aristocracy, including a Kensington studio for Princess Louise, Queen Victoria’s daughter. After Sarah died in 1865 he moved to London, where he became as well known for his furniture as his architecture. Driven, like many of his contemporaries, by a failure to find furnishings to complement his interiors, over the next 25 years he designed around 400 pieces in styles running from mediaeval, Gothic, Georgian and Queen Anne to Egyptian, Japanese and Jacobean. Like his interest in architecture, his fascination with theatre began when he was a small boy. While in Bristol he contributed a series of theatrical and opera “jottings” in which he formulated his belief that costumes and scenery should reflect the time in which the play was set. He wrote further reviews in London during the 1880s when he moved from theory to practice, using his antiquarian knowledge to research period detail, eventually becoming a designer/manager, working with the great actors of his day. In Bristol he had met a 15 year old actress called Ellen Terry, for whom he designed a costume. When they met again in London she was married to the artist George Frederic Watts. Although they never married (G F Watts refused to divorce her), Edward and Ellen lived together for six years, producing a daughter, Edith Craig, and a son, Edward Gordon Craig. The latter became an avant-garde director in his own right, and lover of dancer Isadora Duncan. There has never been any explanation as to why Edward Godwin separated from Ellen Terry in 1875. He later married a young student, Beatrice Philip, by whom he had a son, also named Edward. After her husband’s death Beatrice married James Whistler. Edward Godwin’s most high profile architectural commissions came in the late 1870s when he designed a series of artists’ houses in Chelsea. These, too, had their critics and during the last years of his life the architect found himself drawing up projects for houses and theatres that were never built. His premature death in 1886 led his friends to feel he had never fulfilled his potential. After Ellen Terry died, among her papers was found a sonnet written in his memory by his friend Dr John Todhunter, a poet and playwright who lived in Bedford Park. Having cast off his first architect, Edward Godwin, after press criticism of his designs, in 1877 Jonathan Carr asked the better-known Richard Norman Shaw to draw up designs for his new garden suburb. It turned out to be an inspired commission as Shaw’s combination of practicality and the picturesque was to set the tone for Bedford Park. He had to produce houses which were aesthetically pleasing, easy and cheap to construct, while nodding in the direction of Godwin’s prototypes. The result was a series of different designs, including terraced, detached and semi-detached houses. The style was known as Queen Anne revival, although it borrowed elements from Dutch architecture as well as old Sussex vernacular. He also designed St Michael and All Angels Church (pictured below), the Tabard Inn, the Stores (now offices), Jonathan Carr’s own magnificent Tower House (since replaced by St Catherine‘s Court flats), and elements of the Club. It is sometimes suggested that Norman Shaw also had a hand in planning the layout of Bedford Park, but this seems unlikely. He did not even supervise the construction of his own designs, and his drawings were often modified by builders and other architects. Indeed, his connection with the suburb had ended by 1880, possibly because he had then become seriously ill, although he did later help amend Maurice B Adams’s School of Art designs “to prevent the immninence of bloodshed”. Born in 1831 in Edinburgh to a Scottish mother and Irish Protestant father (who died when he was two), he was articled around 1849 to William Burn in London, also studying at the Royal Academy, where he was a medal-winning pupil. After working for two other architects, he set up his own practice in London 1862/3 in a loose partnership with William Eden Nesfield. This lasted until 1868, although they continued to share offices until 1876. One of Norman Shaw’s first commissions came from his brother Robert, who had co-founded the Shaw Savill shipping line. 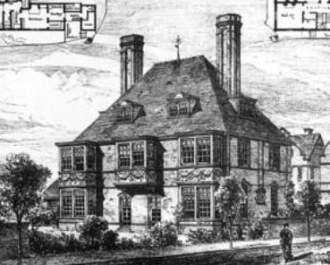 As his reputation grew he designed what Building News called “substantial, dignified, modern residences” – including his own in Hampstead – rather than huge palaces or castles, along with churches, institutions and commercial buildings. In the mid-1870s he followed the pattern of his contemporaries by designing furniture and fittings. Always open to new ideas – he pioneered a method of concrete construction – he also had a strong sense of architectural history. He began by designing Gothic style buildings. Then he developed the Queen Anne Revival style which included not only Bedford Park but also Lowther Lodge in Kensington Gore, now the Geographic Society, and a Hampstead home for children’s artist Kate Greenaway. In 1887 he began one of his most famous buildings – the New Scotland Yard police headquarters in Westminster. His final flourish was what architectural writer Nikolas Pevsner called the “Baroque Edwardian-Imperial-Palladianism of the Piccadilly Hotel in 1905. In 1890 he began an association with London County Council, assessing and amending major building schemes aimed at improving London architecture. Whatever the style, as an appreciation in The Builder of 1912 put it, his buildings achieved balance without resorting to rigid symmetry. Constantly learning and refining his own skills, he was generous with his time and talent, happily allowing a succession of young pupils and assistants to put their own mark on various projects. He treated them and his clients with equal courtesy, often showing an ironic wit. 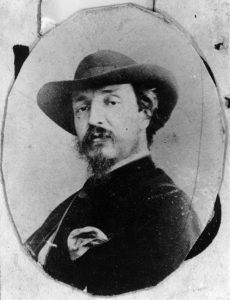 According to his contemporaries, he was tall, thin and distinguished looking, quick of mind, easily amused, suave and persuasive with his clients He described himself to one colleague: “You know I am not a Church man, I am a house man, and soil pipes are my speciality.” In 1867 he married Agnes Wood, 16 years his junior, with whom he had three children. His first-born, Elizabeth, joined the Sisterhood of Bethany (whose Bournemouth Convent was designed by her father in 1874). The second, Robert, who also never married, had a nervous disability. The youngest, Willie, did marry but his wife died leaving him with three young children who all moved in to live with their grandparents.As well as the noise of children playing, the Hampstead house also echoed to the sound of Norman Shaw’s collection of some 170 clocks. By the time he closed his office in 1896 he was regarded as England’s greatest architect who had enormous influence on the Arts and Crafts movement. He continued to work on selected projects from his home until retiring fully in 1909. He died in 1912 and is buried in Hampstead. Born in 1849, died in 1933: Maurice Bingham Adams saw the founding of Bedford Park, lived there during its aesthetic heyday, then watched its sad decline between the two world wars. He had a grandstand view from his editorial chair at the Building News, but as an architect and long-time resident he was constantly switching roles between observer and participant. When the first houses went up by Turnham Green Station in 1875, Building News was quick to criticise Jonathan Carr’s original architect, Edward W Godwin. However, Maurice Adams seems to have been won over to the concept because from 1896 onwards it was his drawings of Bedford Park houses, which illustrated a string of articles about the new suburb. He joined Building News in 1872, having trained in Brighton and then become architect to the borough council. He has variously been described as editor, technical editor and architectural editor, but whatever his title he remained there for over 50 years, combining the role with a private practice and various honorary posts. As a result he had an unrivalled network of contacts in the profession. He came to Bedford Park in 1878, settling first at 14 Woodstock Road. In 1901 he moved to Edenhurst at 1 Marlborough Crescent. Originally designed by Norman Shaw, the detached house with its gables and scalloped hanging tiles was probably adapted by its new occupier. Sadly, it was demolished by Acton Council in the early 1960s, just before the newly-formed Bedford Park Society succeeded in having the houses listed. The site is now occupied by a block of flats called St James’s Court. In 1880 Maurice Adams designed 12 and 14 Newton Grove (the former being the home of the Society’s late co-founder, Tom Greeves) for the artist John Charles Dollman. Both houses had elaborately carved porches and plaster gables, while the larger (no 14), incorporated a studio on the first floor. The following year his School of Art opened in Bath Road. Featuring five Queen Anne-style pedimented gables, it was not a particularly successful design; but it was doubtless better than his first effort, which apparently had to be sent to Norman Shaw to be pulled together. 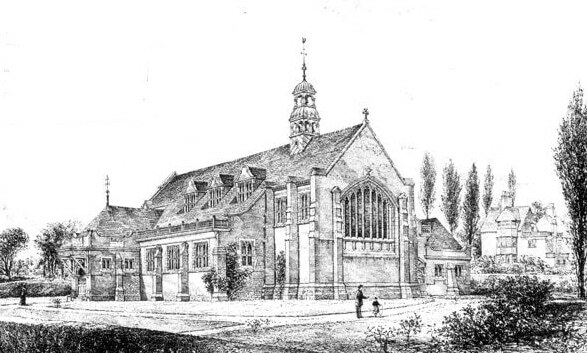 Destroyed by a flying bomb during World War II, the School was replaced by Chiswick Polytechnic and is now the Arts Educational School. He also designed 5 Priory Avenue, and it’s possible that he drew up plans for some of the smaller, cottage-style houses in Bedford Park, as seen in Marlborough Crescent, 35 Queen Anne’s Grove and 12 Blenheim Road. His Church Hall, which fits in so harmoniously with Norman Shaw’s church, was built in 1887. At the same time he completed the church’s north aisle, and also designed the font and pulpit. In 1909 he added the rather Gothic style chapel of All Souls. During his years in Bedford Park he seems to have amassed various properties. His will mentions numbers 5, 23 and 41 Priory Road (now Priory Avenue), 2 Addison Road, 33 Marlborough Crescent and 14 Woodstock Road. He designed various buildings round London, as well as fulfilling commissions in the United States and Australia. Among his more local works were almshouses in Chiswick, and the restoration of All Saints, South Acton. He also designed Acton Library, which opened in 1900 – one of many commissions for public buildings he received from Passmore Edwards, owner of Building News. In addition, he published several architectural books, one co-authored with Norman Shaw and another with Edward W Godwin. He was married for 60 years to Emily, who died in 1927. Of his six daughters and one son, only four survived him. Despite his close links with St Michael and All Angels – he was the first churchwarden there – his funeral was held at Chiswick Parish Church, and he is buried in the adjoining cemetery. In 1882 Richard Norman Shaw wrote to Edward John May, one of his successors as a Bedford Park architect: “So you have tired of old Carr. I must look him up. I expect you have made at least twice as much out of the place as I have. Very glad to think it and to hear that you are driving such a devil of a trade.” If E J May did manage to do well out of Jonathan Carr he would have certainly have surpassed the other architects employed by Bedford Park’s founder. Like many developers, Mr Carr was constantly short of funds and spent much time ducking and diving to avoid his growing debts. Edward May seems to have led a more blameless life. Born in 1853, in 1869 he became the last pupil of Decimus Burton (who designed the Palm House at Kew Gardens), studying at the Royal Academy architecture school. His veneration for his master extended to making a pilgrimage to Burton’s old office every year for 50 years on the anniversary of his first arrival there. 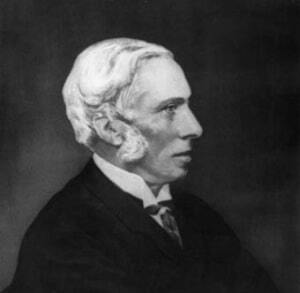 Once his articles had finished he joined Richard Norman Shaw’s practice as an assistant. 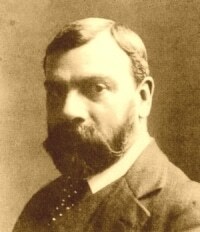 He became part of an informal group of architects connected to Shaw, including the latter’s former partner, William Nesfield. Having been involved with Shaw’s designs for Bedford Park, his appointment as estate architect after Shaw bowed out in 1880 seemed natural. With the development only partly built, Edward May took on the task of completing the 1ayout and designing some of the buildings. To ensure better supervision, he moved into the neighbourhood, living at 6 Queen Anne’s Grove until 1888 with his new wife and growing family – he eventually had six children. The ploy worked, since these parts of Bedford Park seem to be rather better built than earlier houses. He would certainly have been able to keep a careful watch on work on the terrace in Queen Anne’s Grove, which he published in Building News as his own design. Edward May was also responsible for the houses in Priory Gardens, including the pretty terrace with its unusual shell-shaped porches, the Vicarage (pictured right) and number one, now headquarters of the Victorian Society. He designed several houses in The Orchard, Addison Grove, Marlborough Crescent, Priory Gardens and 1 Newton Grove. Having taking over Shaw’s drawings for the Club (now the Buddhist Vihara) on The Avenue, he later enlarged the building, adding a theatre. 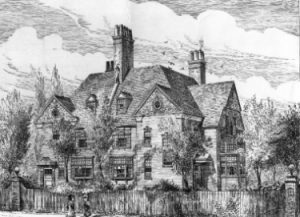 According to Andrew Saint’s hook on Norman Shaw, Edward May was a “considerable architect, an excellent draughtsman, and a charming and humorous man”, yet his work after Bedford Park was disappointing. It has been suggested that his drawings promised more than the buiidings which finally emerged. A sketching tour abroad in 1876 seems to have developed his talent for draughtsmanship, and while working for Shaw he won the Pugin Scholarship with his drawings. Following his work in Bedford Park he developed a practice in Bloomsbury, designing houses in virtually every county in Britain. Among them were Jardine Hall near Dumfries, Barnsdale near Oakham, Swarland Hall, Northumberland and Kirklevington Grange in Somerset. For many years he was architect to the Church of England Waifs & Strays Society and one of his (unrealised) ambitions was to build a church. After his death in 1941, his obituary in the Journal of the Royal Institute Of British Architects describes him as “not exactly retiring, being too full of life and fun to be shy.” For him architecture to the end remained just an absorbing craft which, with his family and home, his garden and his deep religion, filled a most joyous life to the overflowing.